Here’s What you Should Consider When Designing Green Packaging with Labels. Let me ask you this: Approximately how often do you see packaging for green products that uses earth tones and natural imagery? Quite a bit, am I right? But here’s the thing. To stand out on the shelves and market your products, you have to be different. You have to be unique enough to catch the eye of the buyer. There’s a lot of ways you can design your green products. Here are four tips to help you market yourself better when designing your packaging and labels. It’s common to look inward when designing your product packaging. That’s a huge mistake. Green products are often sold in non-traditional settings. Many times, they’re sold in health food stores, upscale grocery chains, or other stores with a relentless focus on eco-friendly goods. Even if the product is sold in a mainstream supermarket, it’s often lumped together in the same section as other green products. By knowing which store will be selling your product(s), you can get a better feel for the type of buyer who will encounter your product on the shelf. Sometimes, this buyer craves the homegrown look and is attracted to subdued eco-friendly colors. Other times, the typical consumer is drawn to certain labeling, such as badges to show the product is non-GMO or vegan. When designing your green product packaging, keep in mind the type of consumer who shops at the store where you will be selling your product. In addition to the consumer, you’ll also need to consider the competition. Who will you be competing with on the shelf? What does the packaging for those products look like? Traditionally, green products are marketed using rustic typography, muted colors, and farmhouse imagery. Although appropriate, it’s not eye-catching, which can stunt your marketing efforts. Take a trip to the store to compare what’s on the shelf. Take particular notice of what isn’t on the shelf. If you do not see bright colors, or bold colors, try incorporating a few of those in your packaging. This will help differentiate your products and make you stand out. Storefronts aren’t the only place consumers are going to buy products these days. Many people like to support small business owners by shopping online instead of in popular stores. This is especially true for health products and smaller product lines. Even in a virtual setting, product packaging plays an important role. Online shoppers still scan products to try to find the best fit for their needs. Your packaging has to be just as eye-catching in a digital world as it is in the physical world. To design for the online buyer, make your label’s copywriting eye-catching, readable, and clear. You’ve gone out of your way to create a natural or organic product. Often, this extra effort means a higher price tag for your consumers. Although health and environmentally conscious shoppers don’t usually mind paying a slightly higher price, you want to keep your costs as low as possible to stay competitive. Consider costs when designing your packaging. You don’t have to break the bank to put together an attractive, eye-catching design. Stay true to your mission of simplicity. Not only will you help the environment by doing so, but you’ll also help make your product more appealing to the consumers who value minimalism. Question: Do you have your finger on the pulse of what’s happening in the industry of green products? If not, you could be falling behind. 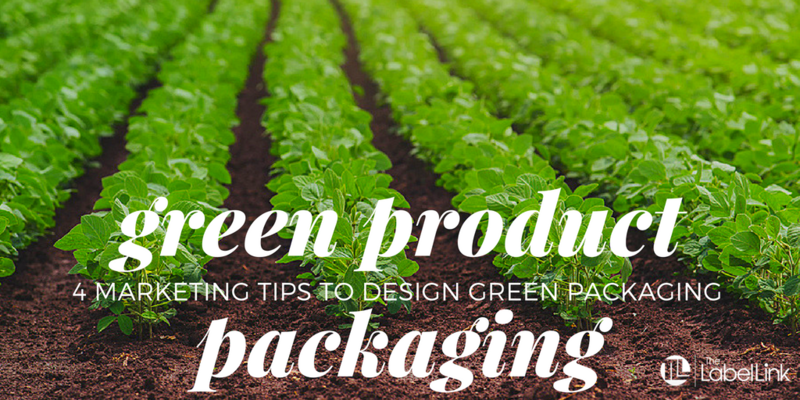 Keeping a steady pulse on what’s happening in your industry will help you continue to innovate your green packaging design and stand out on the shelves. By staying ahead of the curve, exploring new opportunities to be different, and crafting unique stories, you can boost your marketing efforts. Want a little extra help? We’re here for you. Email us to get a response from our labeling experts on your next “green” question. Previous Post Digital Label Printing Companies: Top 10 Questions To Ask Next Post Could Your Commercial Package Design Fail?